The Budapest based BME Formula Racing Team, which has also achieved success on the international stage, has set a truly unique goal for the 2019 Formula Racing season. They are to build one race car instead of two, which will be capable of providing the maximum in both the electric and the self-driving category. We have learned from the team that their goal is to make it up the global top 10 with their electric automobile, as well as to complete at least one self-driving race without an error by using an algorithm that learns in all categories. They team has also told us the following about this year’s season. The Formula Student self-driving race was first held in the summer of 2017. We were determined to design and develop our own self-driving car, thereby keeping up with other major teams. The FRDC-001 is the team’s first driverless race car, which has evolved from the FREC-007 Honey Ryder used during the 2017 season. As a result, we will also be able to compete in the Formula Student self-driving race in 2018. We have not given up on the construction of electric race cars, either, which we have been working on for several years. This has led to the FREC-008, which is an all-wheel drive, independent motor controlled electric car, similar to that of the largest global competing teams. Our automobile is characterized by an aerodynamic package installed on the vehicle which is similar to the ones seen in Formula 1. Therefore we can maintain the highest speed possible in the turns, improving lap times and performance. We have intended to compensate for increased consumption by constructing a battery with higher performance but lower mass. We have also taken the construction of the frame to a new level: our carbon composite monocoque was produced in an autoclave, further increasing the quality of the final product. Our cooperation with Trumpf Hungary Kft. began in November 2015, when we started testing various laser settings for welding the cell tabs of our batteries to find out the most suitable solution. The tests took nearly four month and resulted in the perfect parameters and welding methods for both copper and aluminum tabs. Since then our cooperation has been continuous and unbroken and having the opportunity to weld the cell tabs has been a great help for us from the very beginning. In addition, Trumpf has been purchasing the most suitable cells for us for the second year in a row. Thus we can say that our batteries are in part driven by Trumpf. Besides this providing support of the HV batteries, Trumpf is making it possible for our team to travel to the races. As an example they provided us with a car when the Formula Student race was held at the Hockenheimring in Germany. Trumpf Hungary Kft. has been a diamond team sponsor since 2017. We hope that we will be able to cooperate with similar success during the year 2018 / 2019 so as to achieve our common goals. The BME Formula Racing Team was established in 2007 at the Budapest University of Technology and Economics. 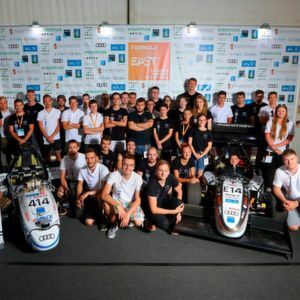 The aim was to achieve the dream of a few young university students to participate in the Formula Student races and thereby establishing a tradition not only at the university, but also throughout Hungary. In addition to design, procurement, production and the construction of race cars, tasks of the team also include management, logistics, and taking care of financial matters. The team currently has 73 active members and includes students of mechanical, transport, vehicle, and electric engineering, as well as technological management and economics.